Originally known as Mount Tabor Village, Montavilla began as a rural farming community in the late 1800’s. When streetcars began serving the area in 1892 a business district developed around SE 78th Ave and Stark Street which was a stopping point for travelers 5 miles from the city center. Today the Montavilla business district is divided into four quadrants – Historic Downtown (SE Stark St between 76th and 82nd Aves), East Glisan (between 67th and 82nd Aves), Stark East (between 82nd Ave and I-205) and 82nd Ave (between Burnside St and SE Hawthorne Blvd). The district is home to a diverse array of shops, restaurants and services and even has its own movie theater and weekly farmers market. However, what truly makes Montavilla special are the dedicated members of the community who have worked to make this area one of Portland’s hottest destinations. 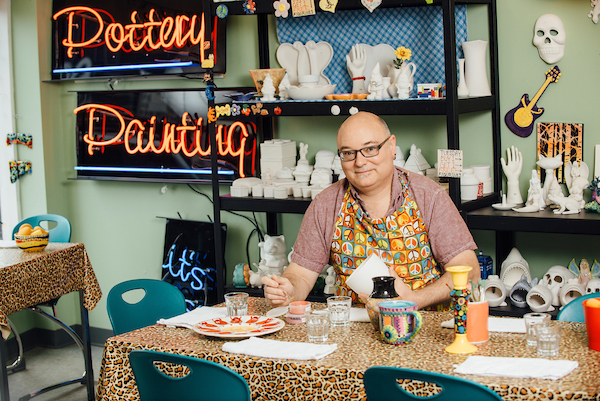 Venture Portland sat down with leaders of the Montavilla/East Tabor Business Association (METBA) to talk about what they love about the district and why they are proud to call Montavilla home. Steve Rice is the President of METBA and has helped the organization rejuvenate its annual events, recruit new members and launch a new website. Alex Jaramillo is a METBA board member, Co-chair of the East Glisan Committee and owner of Mt. 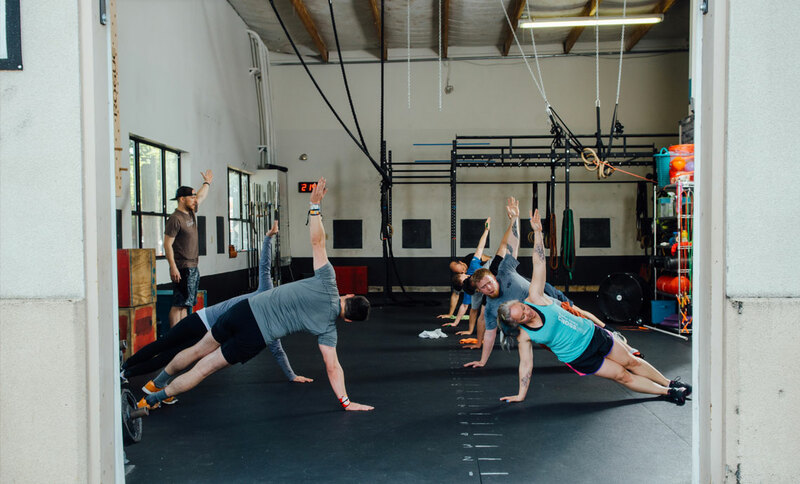 Tabor Crossfit, which offers Crossfit classes for adults and kids, personal training and Olympic Lifting. Adrienne Sweetwater is Montavilla’s District Organizer, the organization’s sole part-time staff member who manages district events and meetings, promotes the area, supports METBA members and the board of directors. What is your favorite thing about Montavilla? Alex: I like the sense of community. You get a warm and fuzzy feeling walking through the district and there’s so many amazing things within walking distance. You can go anywhere in the district and feel like you are in a friendly, welcoming environment. Montavilla’s storefronts have a distinct personality and everything ties together nicely. Steve: The tight-knit community is also my favorite part. There are a lot of people in the district who are super active and really passionate about all things Montavilla. You really get that small town feel in a big city. 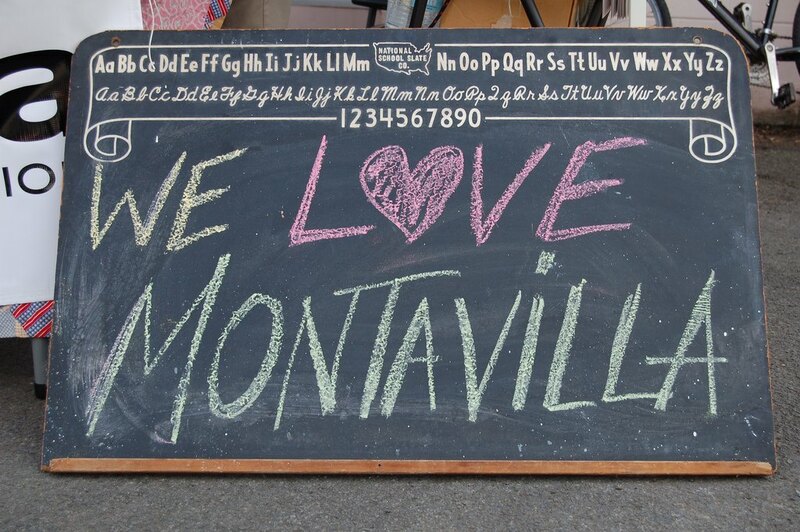 The Montavilla community comes together every Sunday at the Montavilla Farmers Market. The market began in 2007 with 17 vendors and has grown to more than 50 vendors, including florists, cheesemakers, bakers, distillers, restaurateurs, and of course, farmers. 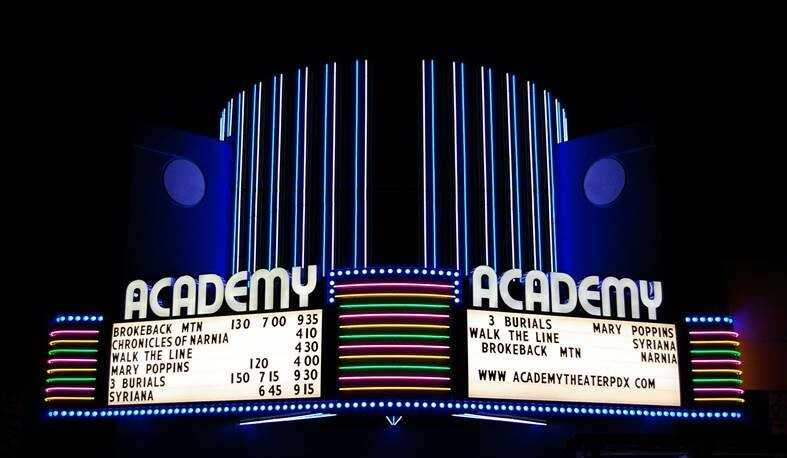 Downtown Montavilla is anchored by The Academy Theater which initially opened in 1948 but shuttered in the 1970’s. In 2006 it was renovated and restored to its former glory, complete with two-story metallic dome and signature marquee. The theater offers affordable screenings of second run and classic films and childcare services. Mt Tabor Park can be seen from most places in the district. The park was built on a dormant volcanic cinder cone and features 190 acres of hiking trails, kids play areas, an amphitheater and reservoirs which were disconnected in 2015 but remain filled to the delight of visitors. How has Montavilla’s identity changed over time? Steve: I’ve lived in the area for 11 years and in that time the district has gone through a pretty radical change. When I arrived, the Academy Theater was boarded up, the majority of current retail businesses and restaurants hadn’t opened yet and the area struggled with crime. When Flying Pie Pizzeria and Ya Hala opened, a dramatic transformation began into the family-friendly destination Montavilla is today. Adrienne: Ya Hala’s current owner, who grew up in the restaurant when it was run by his parents, wasn’t allowed outside of the building because they felt it was unsafe. But now they are thriving and you see families everywhere. Steve: I never used to identify the place that I lived as “Montavilla”. I would say “near Mt. Tabor” or “78th and Burnside”. Now I identify strongly with the district and want people to know where it is and why it is such a wonderful place. Alex: It’s definitely more walkable than it once was. At least 50% of Mt. Tabor Crossfit members walk to the gym. Afterwards we will go to someone’s house and have a barbeque or go watch the game. People are taking a lot more pride in the area and it definitely shows. Flying Pie Pizzeria opened its first location in Montavilla in 1984. Owner Ty Dupuis has won three ‘World’s Fastest Pizza Maker’ titles at the Pizza Olympics in Las Vegas. Ya Hala Lebanese Cuisine opened in 1994 as a Lebanese grocery store but their freshly made offerings were so popular they eventually transitioned into a restaurant. Since then, they have expanded twice and Chef Mirna Attar won Iron Chef Portland in 2013. Other longtime businesses include Vinje & Son Sheet Metal Fabrication which opened in 1963 and creates everything from heating ducts to chimney caps; their famous PDX Tinman sculpture sits at the corner of SE 78th and Washington Streets and often gets dressed up for the season. Lewis Rents which opened in Montavilla in 1965 and rents everything from dump trucks to tools to excavation equipment, Stark Street Pizza also opened in 1965 and serves up New York style pies along with sandwiches and salads. In which ways has Montavilla stayed the same? Steve: Montavilla has blue collar roots and I think that has been maintained to a certain extent. Although everyone in the community needs to be mindful of that in the coming years so we can maintain the things that made Montavilla great. There’s still a nice mix of businesses. In addition to restaurants and retail shops there are also manufacturers like Key Dollar Cab, lumber supply places like Mr. Plywood and automotive businesses like Si’s Auto Body. I find that very convenient. The district has a lot of long-time residents who continue to help preserve the district’s original character. One of METBA’s goals is to ensure that long standing businesses in the district, including service businesses, continue to thrive as new businesses open in the district. Key Dollar Cab started in Eastern Oregon in 1982 and manufactures tractor cabs to protect farmers when spraying their crops. Mr Plywood offers building materials of all types including paneling, lumber, mouldings, and of course, plywood. Recently, Mr. Plywood partnered with neighboring brewery Montavilla Brew Works to create the Plywood Pilsner, a German lager beer. Montavilla’s first and only brewery, Montavilla Brew Works opened in 2015 and occupies the site of a former auto service garage. Portland Garment Factory manufactures clothing for businesses and designers in Portland and beyond including Nike, Adidas, New Balance, Portland Timbers, Coca-Cola, Levi’s and many more. Fix Auto Portland East opened in 1946 and moved to Montavilla in 1985. Second generation owner Camille Eber took over the business in 1989 was named one of the ‘Most Influential Women in the Collision Repair Industry’ in 2000. Montavilla recently expanded its boundaries to include NE Glisan St. What was the motivation for that and what makes that area special? Alex: Glisan Street gets a lot of commuter traffic because of its proximity to the highway and the hospital. There are a lot of longtime businesses like Kim’s International Auto and Sunshine Laundry but in the past several years a lot of new businesses like East Glisan Pizza have created these tight-knit pockets of businesses that are just the start of a very bright future for the street. The success of downtown Montavilla has been very encouraging and I think we can do the same on Glisan Street. Adrienne: There are also several immigrant-owned businesses on Glisan that really make it special including East African Hallal Meat-Deli, A-Rahman Halal Market, Paitong Thai and Bui’s Natural Tofu. It’s very diverse. Steve: As a resident, I felt that the businesses on Glisan Street needed some support in order to organize and really take it to the next level. I partnered with North Tabor Neighborhood Assocation to see if we could create a business association for Glisan Street but it soon became clear that it would be best to join forces with METBA instead. We’re off to a good start with new events like district clean-ups and Trick or Treat on Glisan Street but there’s still a lot of work to be done. There’s a lot of opportunity for development on NE Glisan and METBA’s involvement helps ensure the street continues to meet the needs of the businesses and their neighbors. East Glisan Pizza opened in 2014 and is the brainchild of Oven and Shaker sous chef Vallery Markel. Paitong Thai has been dishing up classic Thai dishes with their signature gluten-free noodles since 2007. They also offer cooking and fruit carving classes. Bui’s Natural Tofu produces gourmet-quality tofu products that can be found in grocery stores throughout Portland. Grocery Getter Organic delivers fresh, local, organic produce and groceries to customers throughout Portland on a weekly or bi-weekly basis. What would be your perfect day of food in Montavilla? Steve: For breakfast I would go to Redwood. It is the most underrated breakfast place on the East Side. Their Chilaquiles are amazing. Then for lunch I would go to Montavilla Farmers Market and get the Oaxacan Mole with fresh blue corn tortillas. Dinner would be a cocktail and a burger at The Observatory unless it’s Sunday, then I would go to East Glisan Pizza’s Lasagna Night. For dessert, I’d go to Hungry Heart Bakery. Alex: I’m also going to have to go to Redwood for breakfast. It is ridiculously good. For lunch I’d get a Kobe Beef Burger from Roscoe’s – it comes with pecan pesto, tomato and fresh mozzarella. For dinner I would go to Ya Hala and get some of the shawarma. Adrienne: I’d actually go to Ya Hala for brunch. They have a Lebanese brunch which is really tasty. I’d go to Kuya’s Cuisine for lunch and get the Chicken Adobo which is made with a mixture of garlic, vinegar and soy sauce. For dinner there’s so many good places but I really like Potted “Judy” Cheese at The Country Cat. I might also get a cocktail either before or after dinner at Vintage. Redwood serves up fresh, seasonal dishes and spirited libations and owner Susie Blue was featured on the Food Network TV show ‘Chopped’. Roscoe’s is known for their extensive beer selection and their website features a live webcam of their ever-changing beer menu so you always know what is on tap. Kuya’s Cuisine dishes up delicious Filipino food and also sells a variety of Filipino groceries. The Country Cat serves up South-Meets-Northwest style dishes using produce from Montavilla Farmers Market. The restaurant was featured on the Food Network TV show ‘Diners, Drive-ins and Dives’ and opened a location in Portland International Airport in 2015. The Observatory opened in 2008 and has gained notoriety for its creative take on American classics and craft cocktails. 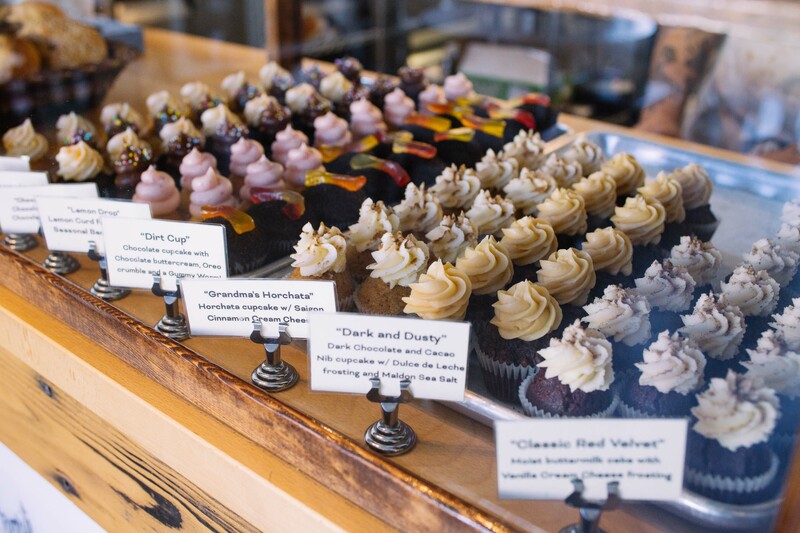 Hungry Heart Bakery whips up fresh pastries, sandwiches and cupcakes and won the Cooking Channel’s ‘Sugar Showdown’ in 2015 with their Elvis Cupcake. Vintage Cocktail Lounge mixes up fiery, herbal and medicinal cocktails not found elsewhere in Portland and hosts a ‘Cocktails and Coloring’ night every week. What’s your favorite time of year in Montavilla? Alex: I like fall. It’s perfect weather for wandering the district with a sweater on and sipping coffee at Bipartisan Café or Fillmore. Adrienne: Fall is also when we do Trick or Treat on Glisan Street, which is an awesome seasonal event where business owners give out candy. Steve: I would say summer because of the district’s proximity to Mt. Tabor which is arguably the best park in Portland. After exercising in the park it’s so easy just to walk down the hill and have lunch in the district. I don’t even have to get into my car. And it’s when the district hosts its annual Street Fair. Last year, we closed Stark Street to auto traffic for the first time ever and it resulted in a huge party with 10,000 people making it the largest street fair in East Portland. This year we’re expecting 100 vendors and 3 music stages with local bands from all over Portland. 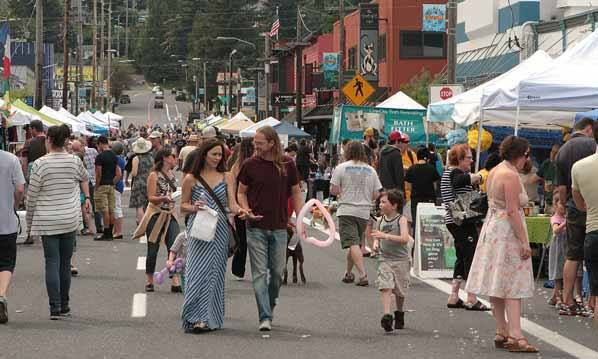 The Montavilla Street Fair is also one of the more-kid friendly summer events in town with businesses in the district like Beanstalk and Eco-baby Gear hosting activities. 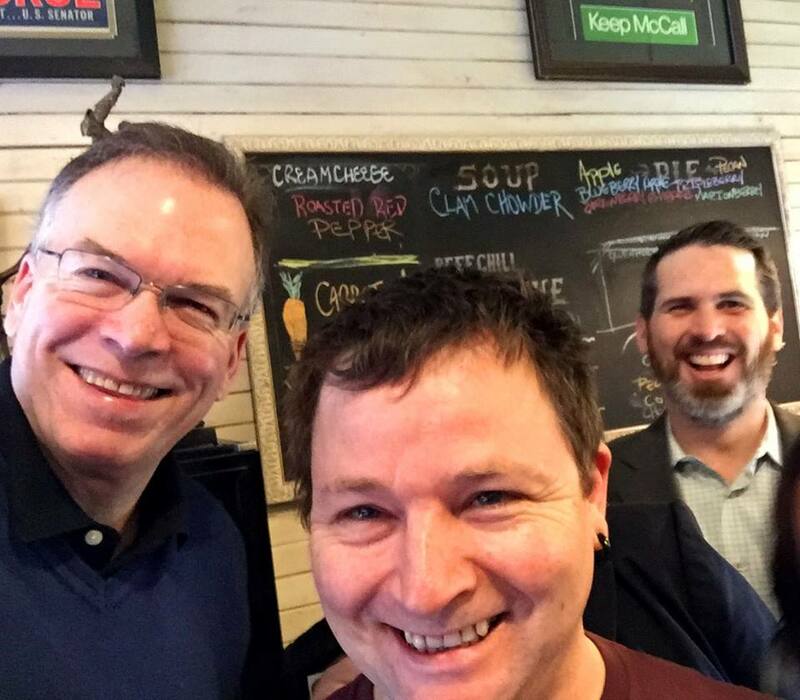 Bipartisan Café opened in 2004 and in addition to coffee, specializes in homemade pies. The café features art and political memorabilia featuring every US president and every US flag arranged chronologically. Fillmore Coffee opened in 2015 and features pastries, pizza and a kid-friendly play area. Eco-baby Gear offers parents and babies safe, natural, organic and eco-friendly products and frequently hosts classes, workshops and parenting support groups. Beanstalk is a family-owned children’s resale store that features a play area and donates to local charitable organizations and families in need. The Montavilla Street Fair is July 31 from 11am to 5pm in Downtown Montavilla – SE Stark St between 76th and 82nd Aves. Alex: Paitong Thai is pretty underappreciated. They are known for their gluten-free noodles but everything they make is fresh and high quality. Vintage gets overlooked too. They have a great selection of Mezcal and Bourbon and create some really fancy cocktails. Steve: The Academy Theater is something that everyone should experience. It’s got beautiful Art Deco architecture and great food and drink options from businesses in the district. Adrienne: Caffe Lubena makes really good pies, cookies and pastries. They don’t have a brick and mortar shop but you can find their stuff at the Montavilla Farmers Market. There’s also La Bouffe International Gourmet which is a great place to find rare ingredients like pomegranate molasses, grape leaves or falafel mix. Montavilla is also a destination for all things health and wellness with businesses such as Bridgetown Chiropractic and Wellness, HealthSource Chiroporactic, Julie Koroch Acupuncture, Montavilla Community Acupuncture, New Heights Physical Therapy, Portland Child & Family Counseling, Serenity Therapeutic Massage and Tabor View Health and Wellness. Other hidden gems include Pottery Fun, a paint-your-own-pottery studio that hosts birthday parties, showers and team building events and its ever popular Margarita Night; Personal Beast, a pet shop that carries locally produced, natural and sustainable products and even has a veterinarian on-site once a month to provide exams and vaccines; Union Rose, a boutique offering locally-made women’s clothing, accessories and gifts; Maven Collective, a shop offering everything from vintage clothing to modish furniture; Beer Bunker, a bottle shop and taproom with hundreds of bottles and 24 rotating taps; Monticello Antique Marketplace, a 20,000 square foot antique shop with more than 100 dealer spaces, salvage garden, furniture showroom and café; and Helens Pacific Costumers, which provides costume rentals to the public and theatrical productions all over the Northwest. Alex, as a METBA board member, what is your favorite Montavilla accomplishment? Alex: I’m very excited about Montavilla’s new website. I think it will be a very useful tool for visitors and everyone involved did a great job rebranding the district. I love all the photos of the business owners. It’s a great opportunity for Montavilla businesses to really enhance their online presence. Steve: We offer lots of great new events and benefits that will hopefully lead to more successful and robust businesses in Montavilla. The Street Fair is our contribution to building community in Montavilla and making the businesses a part of it. If you don’t live in the district, Montavilla is easily accessed by I-205, I-84, Burnside St and the 15, 19, 20 and 72 buses. Visit trimet.org for more information. Bicyclists can also safely access the district via bike lanes on Stark and Burnside Streets. Steve, as METBA President, what future plans for the district are you most excited about? Steve: I always have more ideas than it’s probably good for me to have. One goal is to do more to incorporate businesses on Stark St east of 82nd Avenue. I’d also like to focus on creating a vision for Glisan Street and further economic development in the area. Adrienne: The diversification of METBA’s programming is really incredible. Not only do businesses benefit from tangible things like the website and the Street Fair, but there’s also the Montavilla Vision Project which is really a long-term economic development strategy for the district. Even with all the new programs METBA still offers the things that helped make the district a destination like First Fridays/Frosty Fridays. Learn more about the district at metba.org.